with the likes of the young guys Fowler,Spieth,Thomas etc. hoping to light things up. But don't count out the older bunch like Garcia,Phil,Bubba and the return of Tiger. Or will it be a darkhorse that no one had on their radar? with 68 year old Tom Watson winning,and even had another ace for a Nicklaus. Should be some good stuff the next four days! darpar par 3 was fun to watch! Saw that, was wondering if he just bounced himself from the show. Hope not, but it didn't look too promising, It might be the first HIO at the Masters par3 competition that deadlined a competitor from the event??? It didn't look good, watched it happen live. Found it interesting that they didn't talk about it afterward. Maybe he's fine and just needed to pop his ankle back in? It didn't look too convincing. PA-PLAYA Maybe he's fine and just needed to pop his ankle back in? It didn't look too convincing. I can't imagine him walking to breakfast in the morning much less 72 holes unless the video I saw it was the shoe moving 45° and not his ankle. Pretty sure the pop it back in move was just for show and that he probably isn’t hurt that bad. He definitely tweeked it landing on the side of his foot a couple steps before though and I can’t imagine it will get completely better with two to four days of walking up and down hills ahead. Vijay 3 under through the first 4 holes! WTH? He gave it to Finau. VJ won on the Senior Tour a couple of weeks ago and has been putting better recently, so only a mild surprise. He still hits it long too. Coming back to reality a bit? Now 2 under through 6. Still leads. Gotta be the deer antlers! 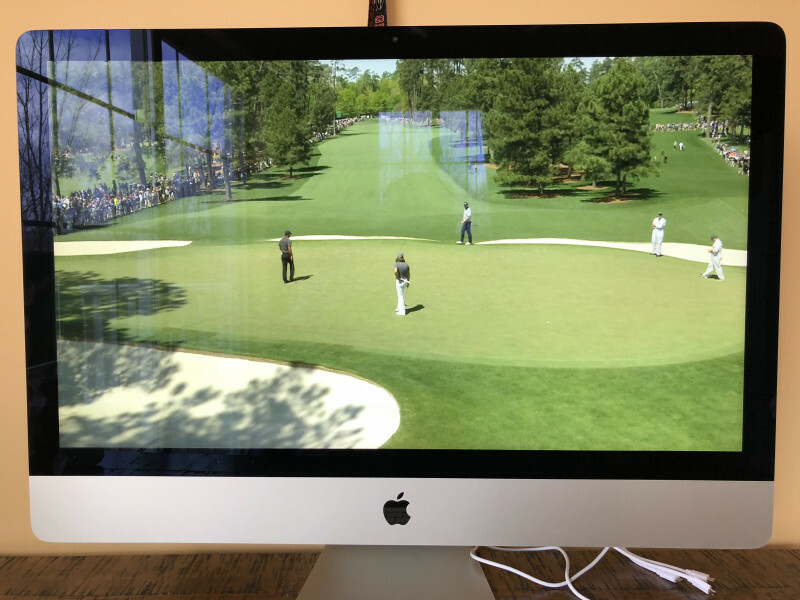 Man takes for ever for the Masters.com leader board to update. I was in attendance for the AT&T National being hosted at Aronimink back in 2010, the year Justin Rose won it. It was also one of Tiger's first tournaments back after the scandal the year prior. Anyway... I watched Vijay for a few minutes at the range, and he was striping his irons. He was peppering the flag at about 190 yards out. He'd hit 3-4 balls with a cut swing, and the ball would land around 15 feet from the flag. Then he'd hit 3-4 balls to the same flag with a nice little draw, same results. Then, as if that wasn't impressive enough, he started hitting driver off-the-deck... The end of the range had to be 350 yards or longer, and the balls would land around 60 yards short of the fence. Keeping in mind, he was using a 460cc deep-faced driver... yet he was barely taking a divot. It was impressive, because Vijay had to have been 47 or 48 years old at the time. Still had a long, rhythmic swing. Really enjoyed watching the par 3 tournament! Pulling for all the geezers also. PA-PLAYA and you don't mind watching on your computer?? What the heck is wrong with you? I guess I’m just a fan of the best-run tournament in all of golf. Although I’m hoping that changes by the time the US Open gets here! It might take that long to get some decent weather here in the northeast. Woody makes a 20 footer for bogey, after finding the creek on the 12th. Immediately hands his putter to his caddie and continues walking to the 13th tee while Tommy Fleetwood is standing over a 5 footer to save par. Sorry, but that's just f-ing disrespectful.